I looked over last week’s cover and sure enough, it was also a Bolland. Guess I’m just not familiar enough with his robots and dogs. So even if the whole concept of the Supercover is a little weak, I’m impressed that the editor of the magazine (Tharg, I suppose) was smart enough to choose the best possible artist to draw them. 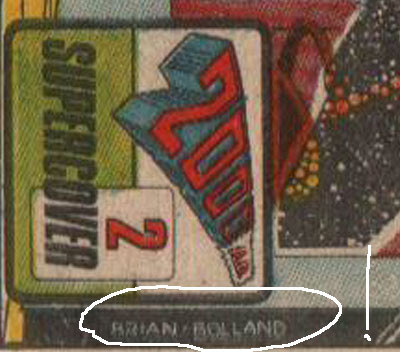 I’m not going to go too in-depth into Bolland here, though – I’ll save my worshiping of the man’s work until he actually starts drawing actual stories in the comic. Tharg’s really excited about this whole Shako thing, it seems. He’s even gone so far as to bump Invasion out of the prestigious Thrill 1 spot for it! So will Shako deserve the prime position? Only time will tell. I mean, I already kind of know, because I read all of Shako in reprints like twenty years ago, but hopefully my memories are fuzzy enough that there can still be a few surprises along the way. Oh, and I’m also going to be testing out the comic’s promise that ‘All of (shako’s) victims die real slow!’ In order to do so, we’re have to define the terms I’ll be using to judge the claim’s truth. So, first off, obviously ‘his victim’ will be anyone that Shako kills. That’s easy enough - although I won't be counting seals, fish, or other non-human life forms that he might also eat. ‘All’ is self-explanatory. ‘Die real slow’ is a bit trickier, after all, if a polar bear were to stalk someone for two hours and then bite their head off, that wouldn’t count as ‘dying real slow’, would it? 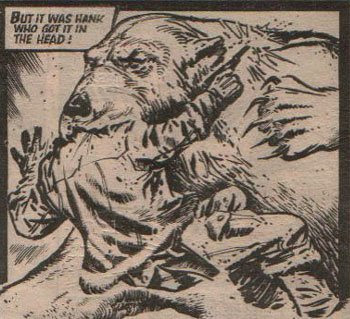 Sure, the whole encounter lasted two hours, but the victim wasn’t ‘dying’ until the polar bear actually swiped his head from his shoulders with a single, playful, bat. So I’m going to define someone ‘dying real slow’ if the amount of time between first physical injury caused directly by Shako until death is longer than five minutes. Now that’s not exactly ‘gutshot’ slow dying, but it’s certainly an achingly long amount of time for a polar bear to take. So, with our terms clearly established, let’s move into the actual story! It opens with a secret CIA jet having engine trouble while flying over the arctic – the pilots want to bail out, but their boss, one Jake K. Falmuth (nicknamed ‘Foul Mouth’ by his men, apparently, although this being a children’s comic will severely hamper any attempts at making that nickname make sense) insists that they crash land, because they’re carrying an unbelievably precious cargo! And because this isn’t an unbelievably pretentious movie, I guarantee to you that we’re going to discover just what that cargo is! In an amazing coincidence, the plane crashes right next to where Shako (a larger-than-normal polar bear) is napping. Rudely awoken, Shako saunters over to investigate, and comes across the secret capsule, which had fallen off the wing in the crash. The plane’s pilot spots Shako swallowing the capsule, and tries to shoot him in the head (the capsule being too valuable to risk hitting with a body shot). The shot goes wild, though, and the pilot pays what I’m sure will become the standard price for trying to kill Shako! The co-pilot tries his luck as well, and it goes just as badly as you’d expect. That really is a big bear, isn’t it? Shako then drops the man, giving him the false impression that he’s being let go – is this man going to die real slow? Nope. Shako was just figuring out whether the man would be edible, which he quickly discovers is, in fact, the case. Back at headquarters, Jake is infuriated by his pilots’ inability to kill a single bear, and invites Eskimo guide Buck Dollar (seriously, that is the character’s name) into the top secret installation to educate everyone about the dangers of hunting polar bears. Buck does offer one important piece of exposition, though – the capsule is both indigestible and too large to pass through Shako’s system, so he’s going to be even surlier than your average polar bear. Jake is unimpressed, and orders some men from the closest ice station to go out there and just kill the thing so they can gut it and retrieve the capsule. 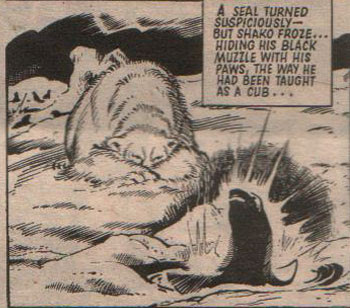 Meanwhile Shako is out hunting seal, which allows the author to drop some educational biology lessons into the story. His hunt is rudely interrupted by some attacking soldiers, who race along the ice in a snow cat, wildly firing at Shako. Shako’s having none of that, though – he quickly lures them to a thin section of the ice and leaps on it, sending the vehicle into the depths, with the four men trapped inside! When the news gets back to Jake, he decides he’s had enough. Jake announces that he’s going to fly up and deal with the Shako situation personally. He also drags Buck along, giving the half-Eskimo time to warn Jake that Shako is an expert killer, and they might well be overmatched. Well, if that’s the case, why are you even going? You know what? 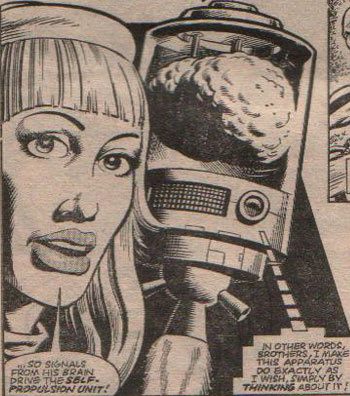 This is, by far, the most promising first part of a story I’ve seen yet in 2000AD. Exciting, fast-paced, profoundly violent. Good work, Tharg, this is an excellent replacement for Flesh. I only hope it can keep up this pace until the end – since, like Flesh, this is clearly not meant to be an ongoing story. While the story itself was wonderful, it proved to be quite an exercise in false advertising. Shako killed six people this week, and all were instant deaths, or near enough to it. 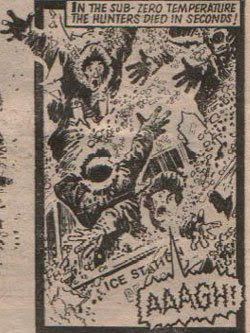 Hell, even the people Shako sent through the ice died ‘in seconds’ according to the caption. So just one episode in, and the ‘all’ portion of ‘all his victims die real slow’ has already been blown, since none of his victims this week died even a little slowly, let alone ‘real slow’. With the first criteria utterly busted, I’m going to adapt the survey in an attempt to discover what percentage of his total victim count will die ‘real slow’. Right now that stands at 0 out of 6, or 0% of his victims. Come on, Shako! 2000AD’s marketing plausibility is riding on you! Pick up the pace… or rather, take your time will all the murder, would you? After his exile from both London and the ‘official’ English resistance, Bill Savage and his gang find themselves forced to drive aimlessly around the country, looking for trouble where they may find it. Arriving at a garage by the highway for repairs, Bill gets some news from one of his mechanic friends (he was a trucker, remember?) – it seems that everyone’s gone underground since the Volgs took over, leaving him without any help he can count on. Bill and the gang head into a local diner, the ‘Greasy Spoon’, for a meal while their van is repaired, but wind up cornered by a Volgan patrol who recognize their vehicle from informer reports. 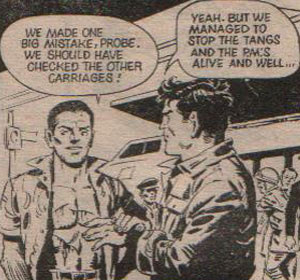 Luckily the Volgans don’t have a good description of the entire gang, so they think they’ve arrested everyone by pointing guns at Silk and the road crew from last week, but miss Savage, who’s gone behind the counter to cook some food for everyone. With the patrol brutally gunned down the Mad Dogs flee the scene immediately before backup can arrive. They don’t even have time to wait for their van’s repairs, which will no doubt lead to trouble down the line. As predicted, Volg backup in the form of motorcycle troopers show up at the garage and gun down the mechanic when he refuses to rat out Savage. They don’t’ quite kill him enough, though – leaving him with an opportunity to phone for some help. Help which arrives just in time to rescue the Mad Dogs as their van breaks down a few miles away. Things look bad for a moment as the Volg motorcycle squadron closes in, but then the British Bikers (on British Bikes!) zoom in, chains swinging. The Brits make short work of the Volgs, and then the bikers give the Mad Dogs a lift out of Volgan territory – they’re taking this resistance on the road, and while this week didn’t give us a themed location-based encounter, maybe we’ll have a little more luck next time. It seems that during his long absence from the strip Louis has had all sorts of enhancements made to his brain-jar. Not only can he fly and give motivational speeches, but his advanced sensors have detected a heartbeat coming from one of the supposedly robotic gargoyles! Giant puts it together than the Gargoyle captain was involved in all the ‘accidents’, and tricks Artie into revealing himself by using his real name during a chase for the ball! Cornered and revealed, Artie has only one play left to him – he pulls out a bomb and announces that if he can’t escape, he’ll resort to suicide bombing the entire team. Apparently he’s forgotten that everyone is wearing jetpacks, and the whole team could have easily flown away in the time it took to make that threat. Unless it’s a really, really powerful hand-held bomb. Desperate to save the galactic council from the Two’s preposterous suicide bomb (wow, two of those this week, huh? ), Dan Dare flies right towards space command’s headquarters. 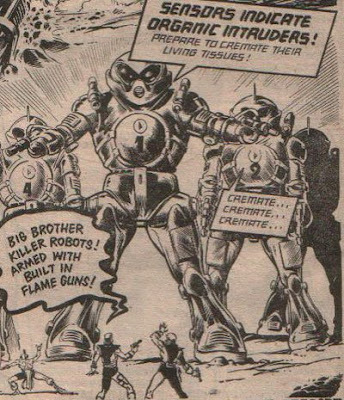 This proves quite alarming for the ships guarding HQ, to whom the sight of a heavily-armed alien craft operating under radio silence is more threatening than not. While making quick evasive moves, Dan comes up with a plan to announces his peaceful intentions – he vents plasma in the shape of morse code! In an amazing coincidence one of the men in the defense grid happens to know morse code, and puts together that the DD written in space must refer to Dan Dare! That’s kind of a leap, but what the hell, anything that moves this story along, right? Dan immediately tries to warn the ground forces about the threat to the council, but Tremayne, the security chief, isn’t having any of it! Because, like all authorities in the world of Dan Dare, he’s an absolute moron who assumes that everyone is lying all the time, even when they have no possible motive for doing so. Dan has Rok pull his light saber on Tremayne, and the tree climb into an aircraft. They quickly make it to the Council chambers, but find themselves confronted by yet another line of defense, this one the least practical, but most entertaining, yet. I love the way that one in the middle just says ‘cremate’ over and over again. He really seems to be relishing the idea, doesn’t he? This week Probe is acting as part of the Prime Minister’s security detail, and it’s a lucky thing as well, because Japan’s security forces are woefully inadequate, it seems. The moment the Prime Minister’s plane (a Concorde, naturally) lands in Tokyo a group of protesters rush the tarmac, and it’s only Probe’s quick fists that save them – and his hard head, when he intercepts a dropped slab of concrete intended for the PM! With the PM safely away, Probe goes to investigate the source of the attacks. His first stop is a meeting with Khan, the oddly-named Japanese agent who was supposed to be in charge of the protective detail. He finds Khan at a dojo, beating up some sumo men for practice. After a quick fight to establish their respective credentials, Probe convinces Khan to team up so that they can destroy the terrorists together! Khan explains that the terrorists are anti-progress, and have become so sickened by Japan’s ‘smog and poisoned food’ that they want to return to a less industrialized state for the country. For an unclear reason, they believe that killing the Prime Minister of England will help them accomplish this. Assuming that the next attack will be on the PM’s train tour that afternoon, Khan and Probe make no efforts to warn anyone, increase security, or cancel the trip. Instead, they just climb aboard themselves, assuming they can stop whatever the threat is. This plan doesn’t go too well for the people in the front two cars, who are killed by the terrorists’ poison gas. The second part of their plan is simple – disconnect the PM’s car so that it will roll backwards down the hill they’re on, somehow causing it to be destroyed. Probe is having none of that, and he uses his hyper-power to span the two cars, holding them together with sheer physical strength. No, Probe, Khan’s right. If you had done your job in the first place none of those people would be dead, and you wouldn’t have had to hold a train together with your body. Even with their various failures the two agree that they are likely the best fighters in the world, and look forward to they day that they can team up once again. 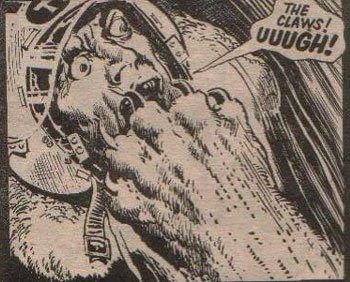 Never let it be said that Judge Dredd isn’t good to his readers. See? That’s a man who knows how to say things out loud to avoid forcing us to read a caption. In addition to his wonderful suit and stylish manner of speaking, Max is always ready to offer some juicy information for the low, low price of ten thousand credits a tip. This week’s info? That classic comics are being sold to kids by a local soda shop owner! That’s right, apparently classic comic books are illegal. Who knew? It seems the comics are super-addictive because of their high quality, and once the kids are hooked, the dealers raise the price. Gee, I wonder which comic they’re dealing? Okay, I’ll believe the the guy he shot on the stairs was just hit in the shoulder, and the man he shot in the back with a riccochet bullet was just wounded, but the third criminal had a heat-seeking bullet plow right through his heart. There’s no way he’s coming out of that alive. So I’m still giving Dredd one kill this week. 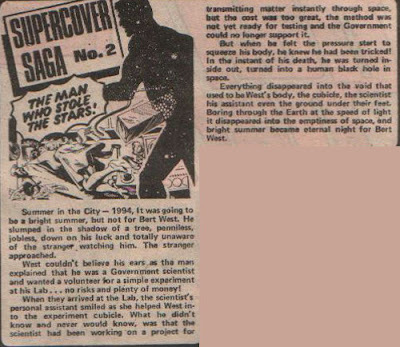 Now that the main plot is wrapped up, we can finally get a look at just what comic was being pushed on kids. 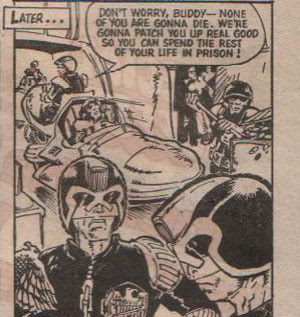 Yup, it’s 2000AD. What a shocker, right? 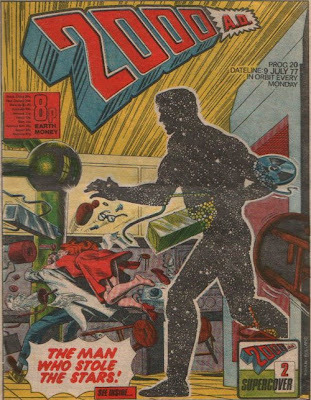 Does anyone else find it a little odd that out of all the covers they’ve done for this comic the one reproduced here is the absolutely worst one, number 13? Whose idea was that? Best Story: Shako – It’s a new story, so I can’t really judge how the arc’s going to work, but the combination of great polar bear art and a quick-moving plot has me hooked. Worst Story: Invasion – In an issue where even Harlem Heroes had some plot movement, this was one hell of a weak installment.